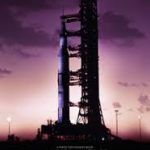 Documentarian Todd Douglas Miller’s “Apollo ! !” is an amazing example of what a great nation can accomplish when it applies its scientific curiosity and bravery to explore the limits of the human experience. Miller used some 11000 hours of audio and hundreds of hours of beautiful film footage from the National Archives to present this “Giant Leap for Mankind” with the kind of impact that will move even the most CGI jaded moviegoer. The first shots of the immense rocket transporter, rumbling along on gigantic tank treads was more awesome than the preview of the latest “Godzilla” trailer that preceded the screening I saw, and that was just the beginning of the jaw-dropping imagery. No talking heads here, just the real time chatter of thousands to technicians, the astronauts, and occasional clips from the coverage by Walter Cronkite to guide us through the mission from beginning to end. I found the experience to be much more impactful than the admirable effort of last year’s “First Man” in giving us a sense of the cool courage of Neil Armstrong, Buzz Aldrin, and Micheal Collins. I struggle with my scanner and various apps on an almost daily basis, and to see this national effort of 50 years ago, pre-wi-fi and internet as we know it, boggles the mind. I had just graduated from college in 1969 and, in spite of attending one of countless national viewing parties at the time, it has taken 50 years, and this film, to really grasp the true dangers and thrills of the Apollo 11 mission. In this time of national political division and stress, see this film and consider this lunar landing accomplishment as an example of what this nation can be truly proud of: scientific rigor and insatiable curiosity in pursuit of a goal bigger than partisan politics.